In May we spent 10 days visiting family, which was absolutely amazing, but I feel like I'm still trying to get back on track and back into the healthy groove that I was in before we left. While we were there we drank a lot, ate tons of Italian food and desserts, and had a general disregard for our healthy lifestyle. Dave worked out once and I napped. We were on vacation! He has had a much easier time transitioning back into being healthy, and has still seen results. I can tell that he's still feeling great. I on the other hand, am having a much harder time. My body seems to be fighting me. I can't get back into the routine of working out, and I find myself constantly snacking. 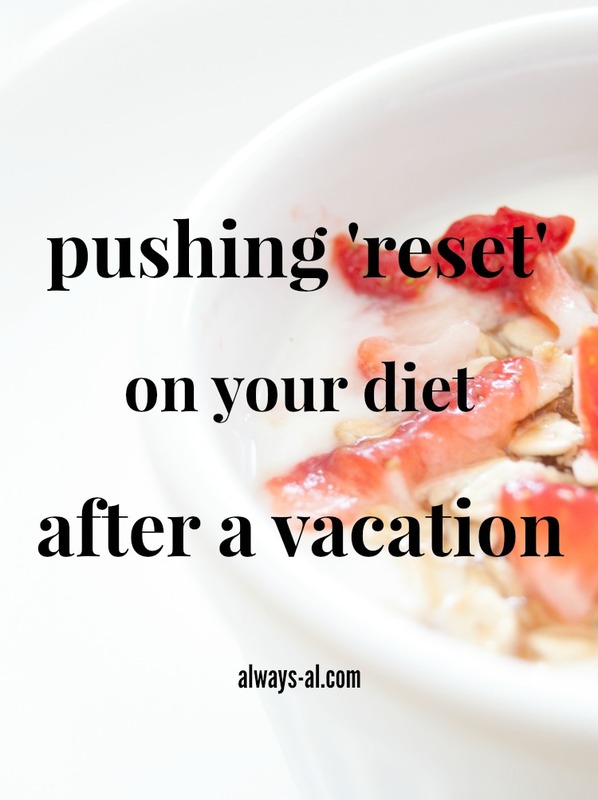 I know I need to do a little "reset," to mostly my diet so I got to brainstorming. 1. Eat more vegetarian meals- We have been eating more vegetarian meals since we got home, and therefore the amount of veggies. This is kind of We could definitely be better about this though. As I'm writing this, Dave is currently making a big bowl of bean, tomato and cucumber salad for us to eat for lunches this week. Perfect!! 2. Drink more water- I was drinking at least two liters of water a day before we went on vacation. Now I'm struggling to drink one! Does anyone have luck with strategies to help them drink more water? 3. Plan ahead- I use the myfitnesspal app to help me track calories, carbs, protein and fat, but I could definitely be more proactive rather than reactive. We try to make all of our food ahead of time, but I need to be better about things like "it's 3pm on a Tuesday afternoon, what is there to eat in my office right now?" I knew that one thing that would really give me a really good clean slate on my vacation eating would be a detox. I have never done a detox before, so I was kind of lost. When I had the opportunity to try the Skinny Teatox 14 day Teatox, I knew this was just the thing I needed. * Please Note: I am not a doctor. Should you have any prior health concerns, please seek proper medical approval before trying this product. Please read all instructions thoroughly and pay attention to your body when using this product. According to their website, Skinny Teatox can help you lose weight, burn calories, boost metabolism, cleanse, detoxify, suppress appetite increase energy levels. The teas are 100% natural and include no chemicals or preservatives. This is a two step teatox. You drink the detoxifying PM tea (which comes in teabags) every other night, and drink the energizing AM tea (which comes loose) every morning. The loose tea easily fits in the strawberry diffuser (so cute!) to go in your cup. I was expecting the teas to not taste good, but they both did! They each had a slightly fruity taste. I didn't lose any weight during this teatox, but I noticed a huge difference in my energy level, and with the amount of bloating that I was experiencing. Following the 14 day program was very easy, as I was already eating healthy. Even thought I didn't lose pounds, I'm happy with my results. A little tmi: You will be using the bathroom a lot more while you are on this teatox, so make sure you are drinking a lot of water! you need to stay hydrated!! Have you ever tried a teatox? 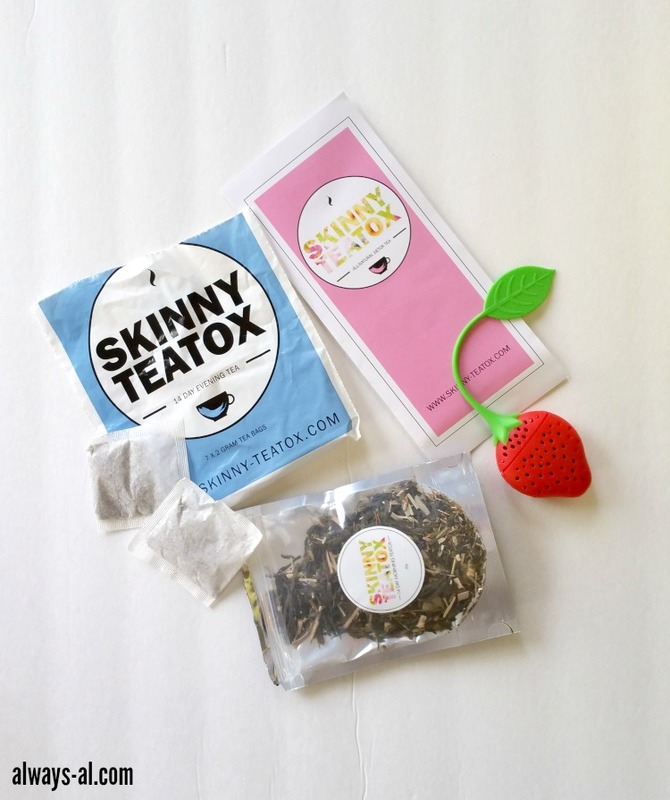 Click here to try Skinny Teatox and help jump start your diet! Ugh I get this way after just a weekend away! When we go to my parents' or my fiance's parents' for a weekend we eat poorly and we don't work out and then coming home I struggle sooo hard to get back on track. That teatox sounds great, even just increasing energy and reducing bloating would be worth it to me! I struggle with this, too. Actually my snacking is terrible lately... and the sweets. ugh. Men seem to have an easier time, or is that just in my house? Anyway, I may have to try this tea! I need a push! I haven't!! I have plans to stop in there this weekend for a pair of sandals I've seen on a few blogs so I'll have to take a peek at that section! I totally agree that men have it easier!! This definitely gave me that little "oomph!"